Blogging about food, specifically recipes for the Blogging from A to Z April Challenge has been just that, a challenge. Certain letters I could come up with a food but not necessarily a recipe. 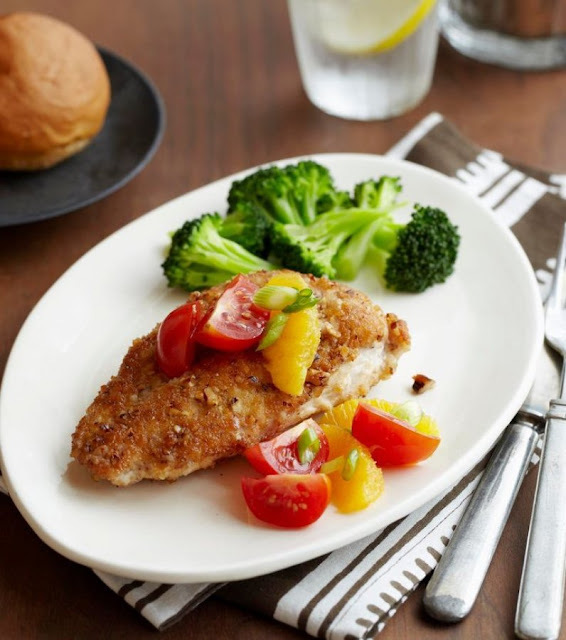 Thanks to some well-timed blog-to-brand networking, I gained access to the perfect recipe for the letter "P": Pecan-Crusted Chicken with Citrus-Tomato Topping courtesy of Kraft. Another reason this is well timed is that this particular recipe is one you can practice over the weekend. It is a quick chicken dish you can knock out during the week after work. It combines a nutty crunch with the refreshing flavors of citrus and tomato. Peel oranges; cut into segments over medium bowl, reserving juice in bowl. Mix 2 Tbsp. orange juice and mayo in pie plate. Combine cracker crumbs and nuts in second pie plate. Discard remaining orange juice; place orange segments in bowl. Dip chicken in mayo mixture, then crumb mixture, turning to evenly coat both sides of each breast. Heat 1 Tbsp. oil in large skillet. Add half the chicken; cook 8 to 10 min. or until golden brown on both sides and done (165ºF), turning after 5 min. Remove chicken from skillet; carefully wipe skillet with paper towel. Repeat with remaining oil and chicken. Serve with roasted new potatoes and hot steamed green beans. Substitute PLANTERS Walnuts or Slivered Almonds for the pecans. Substitute other winter citrus fruits, such as mandarins, clementines or tangelos, for the navel oranges.